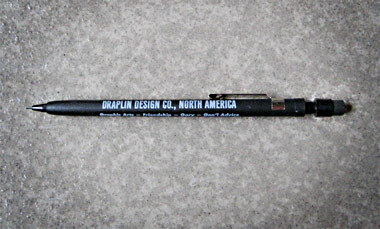 Draplin Design Co.: DDC-027 "Pencil of a Mechanical Nature"
Back when I was in high school I went the “Vo-Tech Way”and shimmied out of the normal hum-drum. I was in the “Computer Aided Drafting” program. Lots of top-side-bottom drawing, some architectural rendering and a whole bunch of computer aided drafting. I loved it. It was precision-based and we were learning a trade. Plus, it was a profitable direction, when comparing our trade against the “small engine repair” guys down the hall. Mean bastards. I remember thinking that was the coolest thing, and how he was talking to us as adults and not these litle piss ant students. Thanks, Mr. Greene. 01. Special push-top action advances the lead real precise and stuff. 03. Comes with a removable eraser. 04. Comes with three leads to get you writing, drawing and sketching. 05. Special metal clip good for securing itself in a pocket or pocket protector.